Shanghai claims to be the largest bike-sharing city in the world, with roughly 1.7 million bikes at the of the end of September 2017. The city drafted one of China’s first city-level bike-sharing regulatory guidelines in April 2017, issuing it in October. The guidelines push local authorities to integrate bike parking with city planning requirements. It requires operators, government officials and agencies to control the city’s bike fleet, such as by requiring bike plate registration, banning shared electric bikes, and guaranteeing more standardized parking by using Geo-fence technology, which uses a Bluetooth-based sensor to detect if bikes are parked in the proper area. 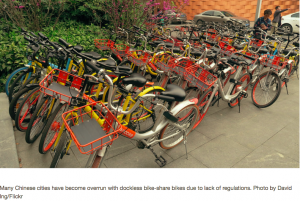 At the urging of these guidelines, Mobike and Ofo, China’s two biggest bike-sharing companies, have made more of an effort to remove bikes in poor conditions from the fleet and relocate bikes during peak use hours. As of the end of October, the total number of shared bikes in Shanghai had dropped to fewer than 1.1 million.